A holiday in the heart of the Pyrenees mountain range is an experience like no other. This area of breath-taking natural beauty acts as the border between France and Spain and, as a result, boasts a totally unique culture and climate inspired by the very best of both of these European holiday havens. Pay a visit to the Pyrenees in the summer and you will be able to take in the fresh mountain air and soak up some truly stunning sights as you enjoy a diverse range of activities. Everything you could imagine and more is on offer in this rugged region. 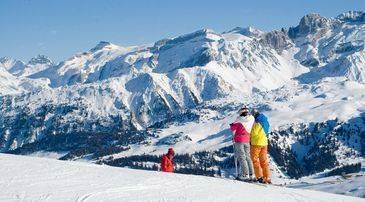 Husky sledging, snowboarding, and some of the best ski slopes in the world are popular ways to spend winters in the Pyrenees, while summer holidays are filled with hiking, horse riding, rock climbing and water sports. If you like the idea of a traditional holiday in the resort of Peyragudes - a town which stands out for its charming, quaint buildings, old-fashioned Pyrenean atmosphere, and wide array of slopes - then treat yourself and the family to a stay at the Résidence Les Terrasses. Located in the heart of Peyragudes, this picturesque residence provides perfect views of its authentic and natural surroundings. Alternatively, Résidence Cami Real is in the heart of Saint Lary, is conveniently located in the centre of the village, close to the shops, restaurants, and tourist services. The only fault you will find with the activities on offer in the Pyrenees is finding the time to enjoy them all! With so much to see and do, every day during your holiday is certain to be action packed from start to finish. To get up close and personal with the beauty and nature of this mountain range, try hiking. There are various options for walking in the region; from gentle paths perfect for family strolls to challenging uphill treks which lead high up into the 3000m mountain summits. Some great routes to try out during a summer stay in the Pyrenees are Le Sentier Cathare  an ancient path with a fascinating history- and Retrouvance Ariege Pyrenees, which can take six days to walk in its entirety and passes the borders with Spain and Andorra. Sports enthusiasts will be delighted with the wide selection of leisurely sports on offer in the Pyrenees. Enjoy playing tennis in the brilliant sunshine, golfing among stunning natural scenery, fly fishing for rainbow trout in tranquil mountain lakes and, the most popular by far, cycling. The Pyrenees are a cyclist's dream. Every age group and ability is catered for here with the wide range of paths and routes. It's easy to see why France's national pastime is so popular in this region and why even the Tour de France route passes through some of the resorts in the area. Many of the summer chair lifts across the mountains provide access for mountain bikes, so cyclists can get up to the most challenging and rugged high altitude paths with ease. There are some seriously exciting adventures available in the Pyrenees which are well suited to families. Many resorts have rock climbing facilities, providing a fun and energetic way to stay active and learn a new skill. From scaling and climbing gigantic boulders in the rocky resorts of Orlu and Targasonne, to indoor climbing walls with qualified guides in Sadernes and Montgrony. Another activity guaranteed to keep children entertained is a trip to one of the many tree top adventure parks. These parks are filled with fun and games for all ages and consist of rope ladders, zip lines, and Tarzan style ropes all suspended high in the trees of the Pyrenees. One of the main highlights of Pyrenees holidays during the summer is sampling the wide variety of cuisine on offer. The traditional dishes of the region are very simple and filling, typically created using fresh mountain ingredients and influenced by Spanish, French and Andorran culinary cultures. Regional specialities include hearty soups, stews, and roasted mountain meat. Recipes in the Pyrenees, like cassoulet, garbure, and aligot, have been handed down from generation to generation and are on offer in mountainside restaurants like L'Estancot Peyresourde in Peyragudes and Chalet de l'Oule which overlooks the Lake de l'Oule in Saint Lary. There are also plenty of more international options available. Also located in Peyragudes, Le Hourgade Peyresoude is known for its British dishes as well as tasty takeaway pizza. The Pyrenees boast an exciting and varied array of nightlife. Whatever you're looking for from a night out, you will find it among the cosy local pubs, cocktail bars, and nightclubs of the region. Traditional British and Irish themed pubs are popular with tourists all year round. These are great options for anyone looking for a fun and affordable night out with fellow holidaymakers in a friendly, welcoming atmosphere. The Melting Pot, between Jean Jaures and Jeanne d'Arc, and The Dispensary in Toulouse are excellent choices. For something slightly livelier, head to one of the Pyrenees nightclubs to drink and dance until well into the early hours. Cosmopolitan in Toulouse welcomes guests to sip on cocktails and fine wine in the lounge or dance the night away on the dance floor. La Bonita, another exciting option in Toulouse, is a Brazilian themed Club which often provides live music. There are hundreds of kilometres of lifts across the Pyrenees. Every resort in the mountains provides guests with access to at least one lift. A few of these are only open for winter visitors, however many resorts keep their lifts open throughout the summer months. An ever increasing number of Pyrenees destinations provide lift access to mountain bike users in the summer, for example, the ski station at Ax3 Domaine opens its lifts for cyclists to enjoy the 1300m of descents in the area. Season passes or day passes can also be purchased online or at local tourist offices. There are plenty of childcare options available for families in the Pyrenees. For example, five crèches can be found located around the Champseur Valley. These are located in the resorts of St Bonnet, St Leger, Chaillol, Ancelle, and Orcieres Merlette but there are plenty more crèches and nurseries located throughout the mountain range. Many tourist offices in the various Pyrenean resorts can provide parents with a list of qualified private nannies and au pairs working in the area. The most popular resorts in the Pyrenees have spacious car parks which will be especially easy to park in during the summer season. A few resorts also have free car parking spaces out on the streets. These will be marked by signposts with the letter 'P'. Some of the more quiet resorts might not offer free spaces but will still provide places to park for a small fee. Tourist offices can provide parking information and maps which display the parking spots available to visitors.